Greetings to all. 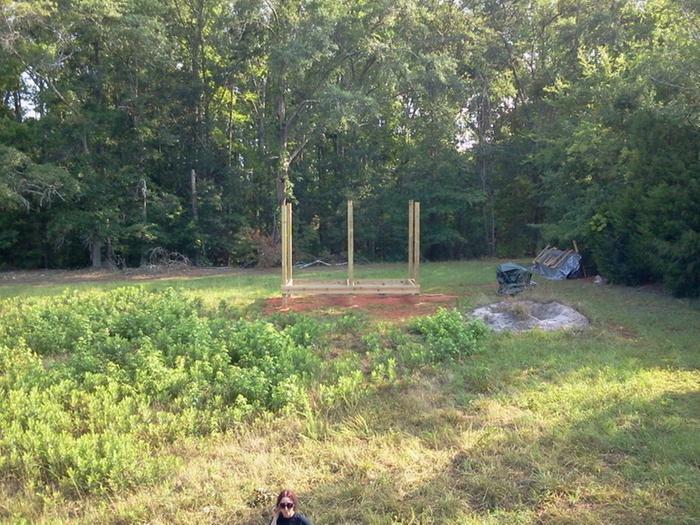 We're going to be working at the land in NE GA next (Memorial Day) weekend. If anyone in the area is interested in dropping by and connecting, PM or email me. Almost all of the counties in GA now require building code compliance, but some seem to be more reasonable than others. A lot can be done that is not specifically within codes if you have an engineer's stamp on the plans. I suppose that makes the code enforcement officials more comfortable since it puts the onus on somebody else if the place falls down. It does mean you need to be working with an architect and/or engineer to draw up plans, which means additional expense, but that's just the way it is these days. You could build on the lam, but I just don't think it's worth the risk, and even if you're planning on living off grid way out in the woods, it'll be hard to get away with. You could also limit yourself to structures classed as mobile or temporary, but that really limits your options, too. At any rate, we've made some significant progress on the water tower in the last few months, and now have the second floor deck framed up and the subfloor down. Next step - the second floor wall and roof framing! Just FYI - we'll be up at our land in NE Georgia Thanksgiving weekend working on the water tower. If anybody will happen to be in the vicinity and would like to drop by and meet, PM me. Kari Gunnlaugsson wrote: doug, here is a platform plan for tipis that might give you some ideas you could adapt for a yurt...it is sectional for easy moving and could be insulated, i thought it was a clever layout. I'm not a big fan of the bubble wrap. A layer or two of felt is really really nice. Not necessarily all that spendy (p.m. me if you'd like..), and bubble wrap isn't free either. It would be a learning curve but i bet you could even make felt, if you get to know a sheep farmer they often have literally tons of fleece to deal with and it's not really worth anything. This is a fun video of mongolian felt making out in the country. I don't know how long the yurt will serve for us, but when i think of all the time and resources we could free up if we never had to build a real house...well, there are a lot of other fun and good things in the world we could direct our energies towards.. Thanks for the link - that's a very cool floor design, and actually very similar to something we did years ago for floors for our SCA pavillions. Those were built more lightly, as we had to schlep them on a trailer from Florida to Pennsylvania once a year, but the same principles apply. I'd definitely be interested in finding a good source for felt. PM to be sent shortly. I had never heard of the gridbeam system. It's like an upscaled erector set, but better! Very cool! Andrew Parker wrote: Buckminster Fuller proposed building a trailer with a full kitchen and a bathroom to which a tent or other temporary structure could be attached, or used as a core to build a permanent structure around. Something like that could cut down on lifestyle changes. You could use the trailer to mount solar collectors (PV and/or evacuated tube, etc. ), house a generator and batteries, water tank, fuel tank, or whatever. You might be able to quilt some wool or cotton batt insulation, rather than use felt. Foil faced bubble insulation is very popular (and reasonably priced, if you look around) with yurts, but it won't breathe like felt or some of the other options. Once you pick your spots, prepare each site to make sure you won't have any drainage problems. The trailer idea occurred to us, and might work for some locations, but I have a feeling that some of our preferred "homesites" might be inaccessible to a trailer. I like it in general, though. The bubble wrap idea for the yurts REALLY appeals to me. We plan on testing it on the yurt we build for temporary shelter whilst building whatever else we end up doing. Kari Gunnlaugsson wrote: Yep, the idea has occured to me as well. Maybe a couple of good basic 'platform' sites. A few seasonal locations, winter snow access and windbreak.....summer shade. Rocket stove at the winter site, and woodshed. The nice part would be having a really thorough spring cleaning and downsizing twice a year. The big drawback for me would be getting too far away from the water well for part of the year. Platforms are what we had in mind, too. Either a wooden deck that can be disassembled and moved, leaving only the piers in each location, or permanent decks in each. I imagine that would depend on my ingenuity in making the decks as "kits." The water issue is a big one, on both the input and output sides. We plan on using composting toilets (which we refer to as Jenkins boxes), so black water would not be a problem, but we'd have to plan ahead for grey water in each location. Water supply we might be able to handle via the infrastructure we plan on running from our well house/water tower to the rest of the property. My wife and I have been fans of your work since first getting the $50 Underground House book years ago (and following it with the greenhouse and y2k books later). We have 15 acres in northeast Georgia, and originally intended to try a PSP home. Unfortunately, we let ourselves be swayed by emotions (fell in love with a particular piece of land) and bought where building codes rule. My first question, then, would be: do you think it is possible to adapt the PSP method for a residence in building code country, or would it be pointless to even try because the costs would go up so much? Even if we cannot use PSP for a residence, we're still looking at it for a root cellar type of facility. My second question, therefore, would be: do you think PSP would be suitable for such a structure in our generally warm, humid climate with relatively high subterranean temperatures? If people can live in yurts through winters in Mongolia, I'm sure they can handle the southeastern US, with the proper materials (although those felt yurt covers can be pretty spendy). I think our biggest problem with the idea would be the necessary lifestyle adjustment rather than the physical practicalities. We're already committed to giving up as much of our useless stuff as we can, in order to live in a more sustainable (economically AND financially) way. Doing the nomadic thing would take that to a different level. It's appealing in many ways, but also intimidating. We're considering building a yurt as a temporary shelter while we build our permanent home on our 15ac in NE Georgia. While we were contemplating yurts, a radical notion occurred to us. What if we never moved beyond the yurt stage? What if, instead of building a permanent home, we continued to live in the yurt(s), and moved them around our land periodically. It's kind of a goofy notion, but it appeals to us in an odd way. We could try out different locations on our land (which is fairly variegated), optimizing for the season or our needs, and it might even get us around some building code provisions, since the "home" would by definition be temporary, even if it only move a few hundred feet from time to time. Anyway, has anybody tried such an approach?